Gourmet Popcorn Fundraiser- Includes 3 Fudge Flavors! 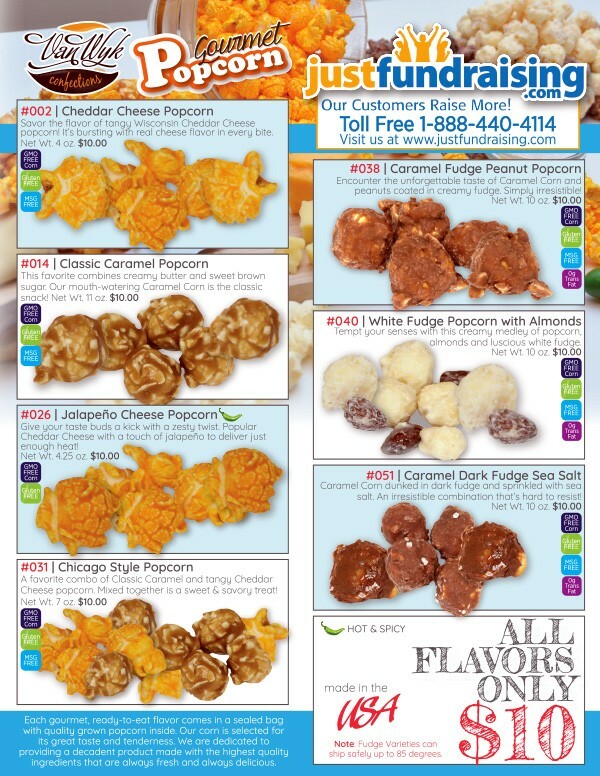 7 Delicious Flavors: Cheddar Cheese Popcorn (4oz), Classic Caramel Popcorn (11oz), Jalapeno Cheese Popcorn (4.25oz), Caramel Fudge Peanut Popcorn (10oz), White Fudge Popcorn With Almonds (10oz), Caramel Dark Fudge Sea Salt Popcorn (10oz), Chicago Style Popcorn (7oz). The Gourmet Popcorn Fundraising Program! Did you know that we Americans consume more than 17.3 billion quarts of popcorn each year? Every bite of our Gourmet Popcornorn is crisp, flavorful, and fresh. Offer your supporters seven fantastic flavors and watch your fundraising profits explode! 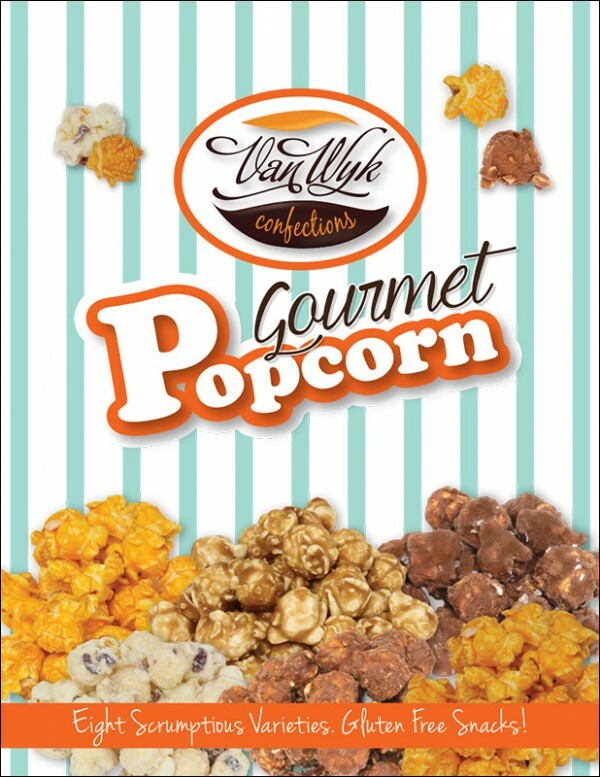 Each gourmet, ready to eat flavor comes in a sealed bag with quality grown popcorn inside. Our corn is selected for its great taste and tenderness. We are dedicated to providing a decadent product made with the highest quality ingredients that are always fresh and always delicious. Product shelf life is 6-9 months depending on flavor. All products are MSG Free and GMO Free Corn, Plus the fudge varieties have 0g Trans Fat. All Made in the USA! FREE to Start: The Gourmet Popcorn fundraising program costs absolutely nothing to get started. Simply let us know how many fundraising participants you have and we’ll send 1 order-taker for each of them, at no charge. Free Shipping and 1 Case Minimums: Your group receives Free Shipping when you sell $1,000 retail or more of Gourmet Popcorn. It's easy - a small group of 20 participants has to sell only 5 units each to get free shipping. Temperature Warning - Is your weather hotter than 85F degrees? : This brochure contains chocolate items. We cannot deliver any chocolate items to you when it is 85F degrees or warmer. How Does the The Gourmet Popcorn Fundraiser Work? 1. 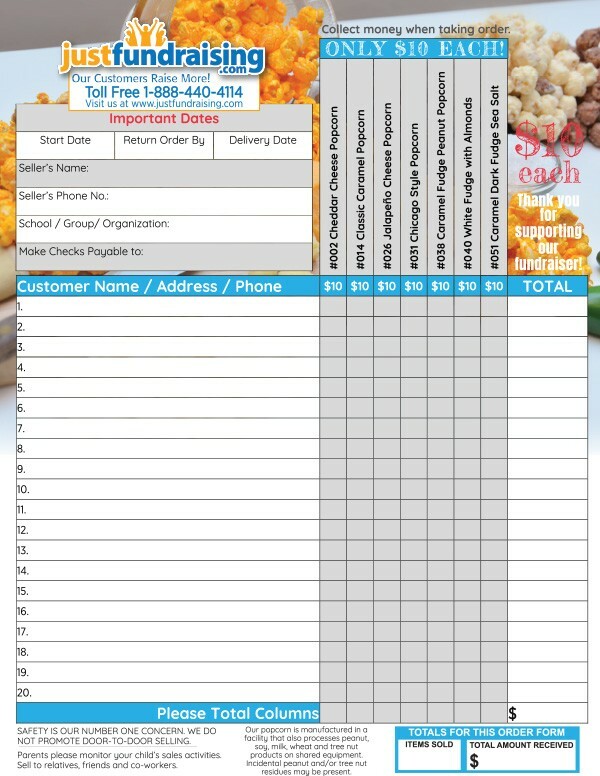 Order 1 The Gourmet PopCorn order-taker PER fundraising participant – they’re FREE of charge! We raised even more than we expected. Our group of 15 sellers raised over $900 which will help pay for renovations to our playground. To promote the fundraiser we sent letters home with students, and also offered gift cards to the top 2 sellers. With only the 6 of us doing the fundraiser, our group raised over $500 selling the gourmet popcorn. We plan on doing this again with our softball league. We gave our group members the option to choose what they would like to sell, and they chose popcorn. A lot of our customers are tired of the usual chocolate fundraisers, so popcorn was a great alternative. This fundraiser is definitely something we plan to do every season.